As the warm weather finally makes a long time visit in Minneapolis, MN, have you began to notice the pests literally coming out of the “woodwork” in and around your home? If so you’ve likely seen your fair share of beetles. At Eco Tech we’re beetle elimination experts and have been extremely busy as of late in our quest to help our customers have beetle free homes! Did you know that there are over 25,000 beetle species that make their home all over the US? With this many different types of beetles it can be difficult to know how to use effective pest control methods to get rid of these pests. At Eco Tech we have years of experience identifying pests like beetles and using a less toxic organic pest control line of products to keep you, your family and your pets safe at all times. Want to Know a Little Bit More About Beetles? We obviously can’t feature all 25,000 beetle species in this blog post but we’ve chosen to highlight a few species that cause problems for homeowners around the country. Carpet Beetles – These beetles are known to eat natural fibers and can damage clothing and other fabric in your home. Powderpost Beetles – These beetles prefer to feed on bamboo and hardwoods, which can include your furniture and other items in and around your home made of wood. Flour/Grain Beetles – These types of beetles love to eat food in your home. Immature June Beetles – Did you know that Immature June Beetles are actually grubs? These grubs attack the roots of your lawn, which can result in brown spots all over your yard. Elm Leaf Beetles – These beetles eat leaves of trees causing damage. 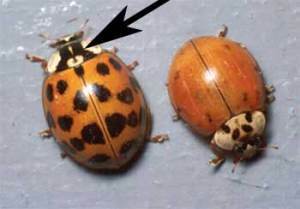 Lady Beetles (ladybugs) – These beetles are actually considered beneficial due to their affinity for common plant pests like mealybugs and aphids. Many farmers and garden enthusiasts encourage ladybug production around their crops and gardens. When you call Eco Tech to take care of your beetle problem we’ll be more than happy to come out to give you a free pest control assessment. We can identify the types of beetles that are giving you problems and suggest a plan for getting rid of them as quickly as possible. This often involves finding areas where immature beetles are living and growing and treating these areas to prevent the beetles from continuing to reproduce in and around your home. We will also help to educate you to learn ways to prevent beetles from re-infesting your home. To setup a free consultation with a pest management professional at Eco Tech contact us today at (763) 785-1414.